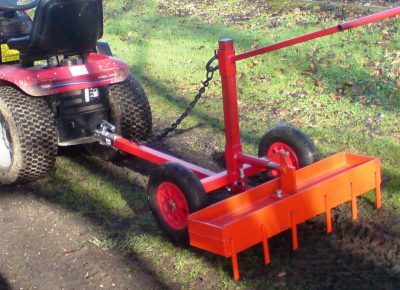 Two models are available, the first is a light trailed implement carrier designed to use small implement which are designed primarily for the two wheel tractor. It is most suitable for small quad bikes and garden tractors, it features a hand lift and greatly increases the number of task that can be carried out with these machines. Price £254. The second is a heavier trailed implement carrier designed to utilise small implements with a three point linkage as used on compact tractors. These are more suitable for heavier quad bikes and other towing vehicles such as 4 x 4s etc. This will allow a number of operations to be performed that would only normally be possible with a tractor. It has a lift system which can be operated with a winch or screw. Price £540 optional ballast tray £46.